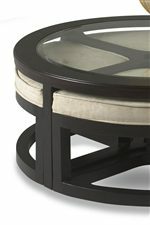 This round cocktail table is the perfect solution for any small living space. It features a modern wood design, glass insert top and a creative answer to extra seating with four pull out upholstered seats. When not using the seats, roll them under the table and out of the way. The Ringlet Round Cocktail Table with 4 Upholstered Seats by Klaussner International at Furniture Barn in the Pennsville, Bear, Newark, Hockessin, Middletown, New Castle, Townsend, Talleyville, Wilmington, Marshallton, Smyrna, Elkton, area. Product availability may vary. Contact us for the most current availability on this product. Case Detail Modern wood designs, black casters. Description: Top Tempered glass table tops. Case Construction Popular solids. Tempered glass. The Ringlet Collection is the answer for any small space. The Ringlet collection is a great option if you are looking for Contemporary furniture in the Pennsville, Bear, Newark, Hockessin, Middletown, New Castle, Townsend, Talleyville, Wilmington, Marshallton, Smyrna, Elkton, area. Browse other items in the Ringlet collection from Furniture Barn in the Pennsville, Bear, Newark, Hockessin, Middletown, New Castle, Townsend, Talleyville, Wilmington, Marshallton, Smyrna, Elkton, area.